A clamp down on criminals day across Bedfordshire has been heralded as a ‘big success’. Op Bing Wing, which took place on Friday (12 February), saw officers tackle a variety of issues – ranging from knife crime, to domestic abuse, to off-road motorcyclists. Assistant Chief Constable Mark Collins, who spearheaded the day, said: “I’m really proud with how the day went. Thanks to the hard work and dedication of our officers and staff, we were really able to show the criminals of the county that this is not a safe place for them to be. “This was a brilliant display of our capabilities as a force and I hope it went some way to reassuring the people of Bedfordshire that this county is a safe place to live and that we are committed to tackling the issues that matter to them the most. In total more than 40 arrests were made and a number of search warrants were carried out. Meanwhile officers visited schools to help educate young people on knife crime, and a knife arch was in place at Chalk Hills Academy. No knives were found in the search. 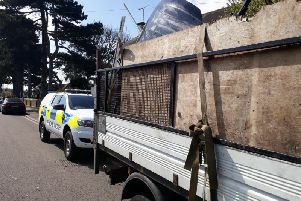 In Houghton Regis and Luton, Op Meteor was carried out as part of the force’s response to tackling off-road motorcyclists. This included police motorcyclists and even saw a drone being trialled. The Domestic Abuse and Safeguarding Investigation Unit were also part of the action, reducing outstanding suspects, and the crime reduction team were out issuing burglary advice in Leighton Buzzard - calling at more than 100 houses. Knife wands were also used during the night time economy and breathalysers were again rolled out to licensees in a bid to help curtail drunk and disorderly behaviour in Bedford, Luton and Dunstable. The days’ activities were documented in a live Twitterthon, with members of the Corporate Communications team tweeting updates throughout the day using #policelive. Click here (https://storify.com/bedspolice/policelive) to see a storify of how the day unfolded.